James will perform on Show 313 in Boston, MA, recorded on October 4, 2015. James Vaughen, 16, lives in Champaign, Illinois, and attends the University of Illinois Laboratory High School. James began trumpet study seven years ago, working with Nathan Mandel, Sal Percoco, and Aaron Romm, and is currently a student of Ronald Romm. James also plays the piano and studies with Kathy Fries. 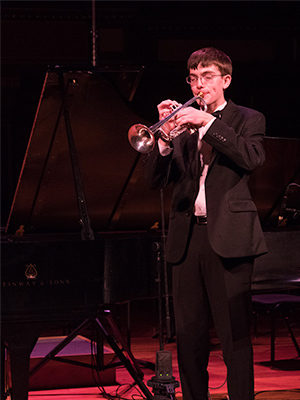 For the past 2 years James performed as co-principal trumpet of the Chicago Youth Symphony Orchestra, CYSO Encore Chamber Orchestra, and CYSO Five Point Brass Quintet. James will be playing the Arutunian Trumpet concerto with the CYSO Symphony Orchestra this fall and has performed trumpet concerti with the East Central Illinois Youth Orchestra and the University of Illinois Sinfonia da Camera. Last spring James placed second in the National Trumpet Competition and was selected as a member of the National Youth Orchestra of the USA. James’ work with CYSO and NYO has taken him on two concert tours of China, as well as performances in Carnegie Hall and Chicago Symphony Center. James enjoys creating arrangements for trumpet and piano and gives many recitals throughout the Champaign area at retirement homes and nursing centers. Outside of music, James is helping facilitate a partnership between his school and Spring Initiative, a nonprofit transformative afterschool program in the Mississippi Delta. James also has fun with photography, running, playing tennis, soccer, and ultimate frisbee, as well as hanging out with his siblings and friends.